Learn entrelac knitting techniques for textural, colorful designs for your handspun yarn. Traditionally, this deceptively simple knitting technique creates small shapes using short row techniques that build upon each other. The overall effect often looks like basketweave as the shapes lean to the right or left and appear to be interlocking. Kathryn Alexander has spent her career exploring entrelac and has taken the medium in so many directions—not only left and right, but up and out, down and around, swirling, whirling, and every-which-way. She finds that the possibilities with entrelac are literally endless and the surfaces she creates are whimsical and enchanting. Learn Kathryn's tips and techniques with her video workshop Entrelac Knitting: Surface Design with Yarn. A fun way to use your handspun, you'll add depth and intrigue to your knitted masterpieces. See the sock that inspired Kathryn's amazing career as a spinner and knitter. Add more excitement to your fabric surface by combining entrelac knitting with energized yarns. Learn how to work short rows without turning your work. Learn how to make right-leaning and left-leaning rectangles, triangles, peaks, boxes, and even knitted swirls. 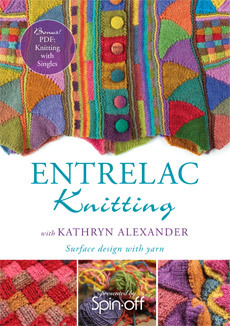 Order your copy of Entrelac Knitting with Kathryn Alexander today!